Recently there have been several advancements in the technology of solar power. Not only are scientists developing less expensive solar panels, but they are also making them much more efficient. First, a rough outline on the plausibility of solar power. "According to many energy experts, the world will need 30 terawatts (TW) of energy resources in place by the year 2050 to maintain economic growth and accommodate the increasing energy requirements of rapidly expanding economies such as China and India. 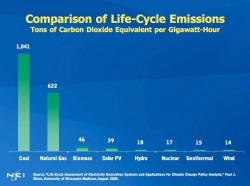 This compares to today's 13 TW of continuous worldwide energy consumption, of which the U.S. uses one-fourth. The greatest part of this new energy will have to come from non-carbon sources to avoid irreversible and catastrophic climate change.... To accommodate this kind of explosive growth, a source of energy is required that is almost limitless, and yet does not add to greenhouse emissions. For this reason, many scientists are looking toward the sun for a solution.... More energy strikes the earth from sunlight in one hour than all the energy consumed in the planet in a year, according to Cal Tech materials chemist Nate Lewis, who co-chaired the Department of Energy's Solar Energy Workshop. He estimates that a minimum of 600 TW of useable solar energy is available worldwide. With a solar energy conversion rate of 10 percent, well within current capabilities, the sun could provide us with 60 TW of energy, about double the amount we will require by 2050"(azonano.com). Silicon is the most expensive material used in solar panels, so scientists are finding ways to decrease the amount of silicon used in the production of solar panels. One of the ways that this is being done is by a new type of solar panel called a thin-layer silicon photovoltaic cell. They employ a technique to deposit a very thin layer of silicon on the panel only a few nanometers thick. This drastically reduces the amount of silicon needed to produce the solar panel which greatly lowers the price of the panel. In addition to decreasing the amount of silicon used, scientists are trying to find new materials that will replace silicon altogether. A promising candidate for this is cadmium telluride. Cadmium telluride is a crystalline compound that works in much the same way as silicon cells. It works with a comparative efficiency to silicon cells as well. The only difference is that cadmium telluride is about half of the price as silicon. Another possible breakthrough is being developed with the use of titanium oxide and iron oxide nanotubes. New advances in nanotechnology have allowed scientists to design complex structures using titanium oxide and iron oxide. These nano structures work in very different way than silicon cells in generating electricity. They can be made more efficient because they absorb a much broader range of light wavelengths compared to silicon. The benefit of using iron oxide is that it is a very abundant material and very inexpensive. Although this technology is in its early stages, it has the potential to become a very cheap and extremely efficient alternative to silicon solar panels.